We live in an era where you can do almost everything using a computer or a smartphone. It is therefore not a surprise that the world’s first ever digital currency, Bitcoin, is now one of the most used currencies in the world. Indeed, there are a lot of good things that come from using digital currency, one of them being the ability to track all payments thereby reducing cases of fraud. Since many people are not conversant with the sophisticated Bitcoin mining procedures, a lot of sites set up by IT experts and programmers have come up and are selling Bitcoins to the general public in exchange of ordinary currency. These sites have helped a lot of people acquire Bitcoins without breaking much sweat. And we are good with that. Now, since quite a number of people now possess Bitcoins, they don’t really know what to do with them. As it is, not too many shops or businesses accept Bitcoin payments, which means that their collection of Bitcoins are pretty much useless outside the world wide web. And that’s where Bitcoin investment companies come in – to help people earn money by investing their Bitcoins in the global financial markets. Some of them are real and are actually profitable while most are scams who don’t pay anything. Unfortunately, it is very difficult for an ordinary person to differentiate between the two and most end up being conned. We try as much as we can to help by making a list of the trustworthy investment companies and another for the scams. In this article, we take a look at Table Bitcoin, one of the biggest scams in the market. 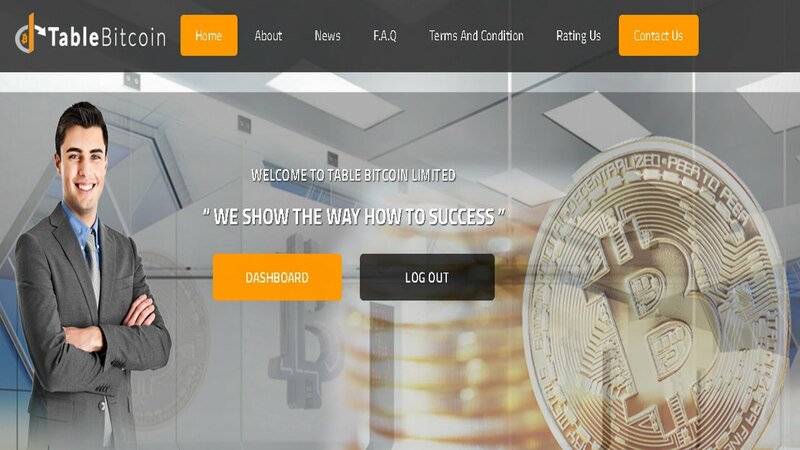 Table Bitcoin Limited is a UK-based company that deals in short and long term Bitcoin investments. The company apparently invests in a range of profitable areas such as Forex and stock markets and gives daily, weekly and monthly returns to their investors. They also invest in hedge funds and other unspecified for-profit activities. The official website claims that Table Bitcoin was created by experts in the fields of cryptocurrency mining and financial investments and makes use of AI programs and bots to carry out investments. These bots apparently carry out market research and generate predictions which are then used by the site owners to trade in the financial markets. And as you would expect from a Ponzi scheme, Table Bitcoin claim to not make any losses and guarantee lifetime returns. According to official documents that we came across, the company was officially registered in the UK on 10th February as a financial services provider. The domain name TableBitcoin.com was officially registered on 24th March 2017, a little more than a month from the company’s date of incorporation. Hourly forever – Under this arrangement, you will receive 0.88% returns on your investment every hour until you die, or the world ends, whichever comes first. Minimum investment is only BTC 0.001 or its equivalent in paper currency ($1.59 at the time of writing). 25-Day plan – In this plan, returns will be paid after every 25 days at the rate of 9,000% of the investment amount. This simply means that when you invest the Bitcoin equivalent of $100, you will receive $9,000 when 25 days are over. VIP Plan – This plan is clearly for the moneyed traders. The minimum investment required to become part of this plan is BTC 250 (almost $400K) and you will be assured of 7,000% returns in just four days. Whether you have any experience in financial trading or not, you can agree with me that the above figures sound unbelievable. Too good to be true even. Tell me any (legal) business you know that can give you 4,000% profit in 4 days. I’ll wait. The truth of the matter is, Table Bitcoin is not a Bitcoin investment company but a HYIP, or a High Yield Investment Program. These are, in layman’s words, companies that promise high returns without giving any tangible source of income, more like pyramid schemes. They will ask you to pay a registration fee after which you will be told to refer a couple of your friends in order to earn more money. Eventually, when there are no new members joining the chain, the entire pyramid will collapse and you won’t know what happened to your money. Exaggerated returns percentages – The site claims to be able to pay more than 9,000% returns in just over three weeks. The question is, where does all this money come from? Well, we too don’t know. What we know is that there is no legal business that will guarantee you such high returns for a lifetime. Table Bitcoin is a big lie! Who are the owners? – As much as companies are legal entities on their own, they are still inseparable with their owners. For a high risk company such as Table Bitcoin, there is no better way to earn the trust of investors than by parading the management board and having them say something about the company. In this case, however, don’t see even a single member of staff shown anywhere on the site. This could be an indicator of the untrustworthy nature of the site’s owners and further supports our theory that they have something to hide. The above comments may not be grammatically correct but they make a lot of sense. We have a site that only pays returns for the first few days and then takes investors round in circles until they just give up. What more, Table Bitcoin has not come out to substantiate these claims so it is only right if we hold them to be true. We need not to have invested or lost money in Table Bitcoin to give a scam rating. Everything about the site sounds a bit off. For one, there’s too much advertising and the alleged returns are not sustainable or real in any way. Simply put, Table Bitcoin is a scam, a big one at that. We suggest that you stay as far as you can from TableBitcoin.com and tell your friends to do so too. Our research indicates that the Table Bitcoin fraud is mainly targeting people in India, Russia and Cambodia. If you have already been scammed by Table Bitcoin, or if you would like to leave us any feedback, please write a comment below. To receive additional scam warnings from us directly to your inbox, please subscribe to ScamBitcoin.com! Learn about real Bitcoin and Cryptocurrency Mining.